When it comes to color in the garden, spring and fall are easy, even winter can have bursts of color and interest with a little decorating and good design. It's mid to late summer when a lot of gardeners notice that the perennial garden isn't as colorful as it was earlier in the season. If that sounds familiar, click HERE to watch me on WFSB's Better CT talking about five perennials that will add lots of lasting color to your summer garden. Perennials that are in bloom right now! 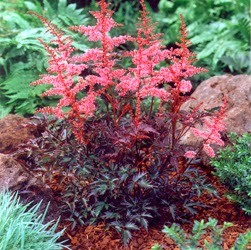 A dwarf form, with deep magenta, feather-like plumes above dark green and burgundy foliage in summer. Great as an edging plant or for front of the border. Flower spikes reach 15-18" tall, with foliage to 10". This All-American Selections and Fleuroselect Gold Medal winner has 3" wide, mahogany red pinwheel flowers with bright yellow on the edges of the petals. Has a compact, mounding habit growing just 8-10" tall and up to 12" wide in full sun. 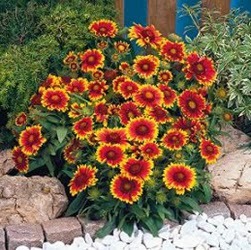 Blooms as early as mid-May, up to a month earlier than other Gaillardia and continues blooming until first frost. Lance-shaped, fuzzy, grayish green foliage. The perfect choice for the front of the border or in containers. Blooms late May through Oct. Cut back periodically to refresh buds and promote rebloom. About Lil Bang™ Series: This sub series of the Big Bang™ series features compact Coreopsis varieties that have the same unique bloom colors but on plants growing just 8-10" tall. They are perfect for use containers, as edging or in front of the border. A dwarf form with 12-15” fluffy spikes of rich, violet-lavender button flowers midsummer. The glossy, deep green foliage adds to the attraction. 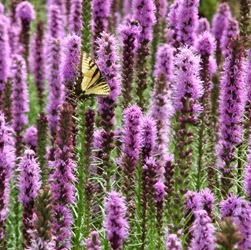 About Liatris: The vertical growth habit of Gayfeather gives a strong contrast to the many rounded forms of the perennial garden. Excellent as cut flowers, they also attract butterflies. Most are quite tall and work midway to the back of the garden. The dwarf is suitable from mid to front. 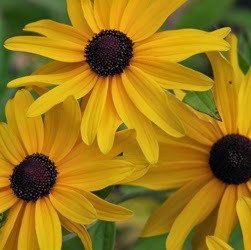 Clear yellow daisies with black-brown centers bloom on stiff stems 30-36” tall. Long bloom season. Late summer color and anise scented.